Not to be confused with Farmingville, New York. 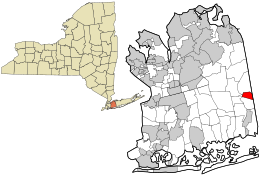 The Incorporated Village of Farmingdale is an incorporated village on Long Island within the Town of Oyster Bay in Nassau County, New York, United States. The population was 8,189 at the 2010 Census. As of 2012[update], the mayor was Ralph Ekstrand. The Lenox Hills neighborhood is adjacent to Bethpage State Park and the rest of the town is within a fifteen minute drive of the park. It is also approximately 37 mi (59 km) southeast of Midtown Manhattan and can be reached via the Ronkonkoma Branch of the LIRR. The Long Island Expressway and Seaford Oyster Bay Expressway is the best way to reach Farmingdale from the city and the mainland. 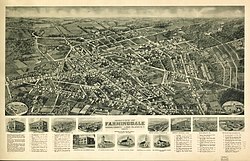 Farmingdale is also associated with several unincorporated areas outside the village limits, including South Farmingdale (also in the Town of Oyster Bay within Nassau County), and East Farmingdale (in the Town of Babylon within Suffolk County). Many nearby places not within the village limits have Farmingdale as their postal address and the same 11735 ZIP code. Residents of East Farmingdale must use Farmingdale as their mailing address, and residents of South Farmingdale can use either Farmingdale or South Farmingdale. Bethpage State Park, which is mostly in Old Bethpage, also has a Farmingdale mailing address. Farmingdale Union Free School District (UFSD 22) includes parts of both Nassau County and Suffolk County. A road sign on Main Street in the south-east section of South Farmingdale (and over a mile from the Village of Farmingdale) welcomes travelers to Farmingdale. Farmingdale is also the name of the local Farmingdale Water District and Farmingdale Fire District, both of which also include areas outside the boundaries of the Village of Farmingdale. Farmingdale State College and Republic Airport are in East Farmingdale, both with Farmingdale mailing addresses. The first European settler in the area was Thomas Powell, who arrived in 1687. On October 18, 1695, he purchased a 15-square-mile (39 km2) tract of land from three Native American tribes. This is known as the Bethpage Purchase and includes what is now Farmingdale, as well as Bethpage, Melville, North Massapequa, Old Bethpage, Plainedge, and Plainview. One of two houses he built in the area (circa 1738) still stands on Merritts Road in Farmingdale. In the 1830s, anticipating construction of the Long Island Rail Road (LIRR), land developer Ambrose George purchased a large tract of land between a community then known as Bethpage and an area in Suffolk County called Hardscrabble. He built a general store in the western part of this property which he named Farmingdale. When the LIRR started service to the area in October 1841, it used the name Farmingdale for its latest stop, here, on the line it was building to Greenport. Stagecoaches took people from the Farmingdale station to Islip, Babylon, Patchogue, Oyster Bay South, and West Neck (Huntington area). In 1886 a fire department was organized. The Village of Farmingdale was incorporated in 1904. In 1912, the State Agricultural and Technical school was established. The Lenox Hills Country Club, an 18-hole private golf course designed by Devereaux Emmet, was developed north of the community in 1923. This golf course was purchased by the State of New York, expanded and opened as Bethpage State Park in 1932. The original 1920s era Lenox Hills subdivision and later adjacent subdivisions, located between the Bethpage State Park golf course and the Long Island Railroad trackage, encompassing rolling hills and a wide boulevard, are known as the more upscale part of Farmingdale Village. Later, Farmingdale became a locus for the aircraft industry, notably Republic Aviation Company. In 1899, Mile-a-Minute Murphy rode a bicycle along the Long Island Rail Road's Central Branch through the Farmingdale area at a mile a minute. For many years, the town celebrated its birth with the annual Hardscrabble Fair, with music, food and games. It was normally held in May. Farmingdale is located at 40°44′0″N 73°26′42″W﻿ / ﻿40.73333°N 73.44500°W﻿ / 40.73333; -73.44500 (40.733471, -73.445083). According to the United States Census Bureau, the village has a total area of 1.1 square miles (2.8 km2), all land. Between the 1990 Census and the 2000 census, the village gained territory. Farmingdale is served by Republic Airport, a major general aviation reliever to the east of New York City; NICE routes n70, n71 and n72; and the Long Island Rail Road's Farmingdale station. Major roads are New York State routes 24 (Conklin Street), 109 (Fulton Street), 110 (Broad Hollow Road), Southern State Parkway, Bethpage State Parkway, and 27 (NY 27). The village is the site of a transit-oriented development centered around the LIRR station. As of the 2010 census The population of the village was 88.2% White, 71.1% Non-Hispanic White, 2.6% African American, 0.4% Native American, 2.5% Asian, 0.0% Pacific Islander, 4.7% from other races, and 1.7% from two or more races. Hispanic or Latino of any race were 13.7% of the population. As of the census of 2000, there were 8,399 people, 3,216 households, and 2,051 families residing in the village. The population density was 7,432.2 people per square mile (2,869.8/km²). There were 3,289 housing units at an average density of 2,910.4 per square mile (1,123.8/km²). The racial makeup of the village was 87.03% White, 1.61% African American, 0.12% Native American, 3.70% Asian, 0.05% Pacific Islander, 5.06% from other races, and 2.43% from two or more races. Hispanic or Latino of any race were 12.57% of the population. There were 3,216 households out of which 28.3% had children under the age of 18 living with them, 50.2% were married couples living together, 9.5% had a female householder with no husband present, and 36.2% were non-families. 29.8% of all households were made up of individuals and 11.5% had someone living alone who was 65 years of age or older. The average household size was 2.55 and the average family size was 3.19. In the village, the population was spread out with 21.2% under the age of 18, 7.3% from 18 to 24, 35.2% from 25 to 44, 21.6% from 45 to 64, and 14.7% who were 65 years of age or older. The median age was 38 years. For every 100 females, there were 95.2 males. For every 100 females age 18 and over, there were 92.5 males. The median income for a household in the village was $58,411, and the median income for a family was $68,235. Males had a median income of $46,104 versus $36,021 for females. The per capita income for the village was $27,492. About 3.0% of families and 5.6% of the population were below the poverty line, including 3.5% of those under age 18 and 13.0% of those age 65 or over. Peter J. Ganci, Jr. (1946–2001) Chief of Department of the FDNY who died during the September 11 terrorist attacks. Ed Kranepool, original New York Mets, resided in South Farmingdale, New York. April Lawton, musician and artist, member of Ramatam. SallyAnn Salsano, producer of MTV reality shows including Jersey Shore via her 495 Productions company named for the interstate passing by the community. Adventureland (New York), a Farmingdale amusement park. ^ "Inc. Village of Farmingdale". www.farmingdalevillage.com. Retrieved 6 April 2018. ^ "The Long Delay at Hicksville". Newsday. Archived from the original on 2007-02-16. ^ David Roberts. "Nassau County Post Offices 1794-1879". Retrieved 2008-04-07. John L. Kay; Chester M. Smith, Jr. (1982). New York Postal History: The Post Offices & First Postmasters from 1775 to 1980. American Philatelic Society. ^ Bureau, U.S. Census. "American FactFinder - Results". factfinder2.census.gov. Retrieved 6 April 2018. ^ "Farmingdale State College". www.farmingdale.edu. Retrieved 6 April 2018. 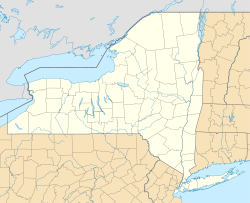 Wikimedia Commons has media related to Farmingdale, New York.